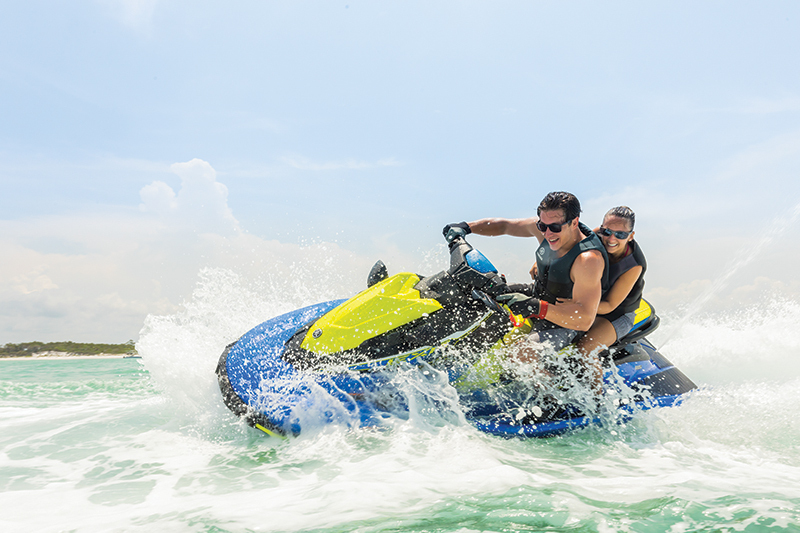 Rec-Lite is a relatively new category of personal watercraft and is used to describe sleds that are smaller and less expensive than a full-sized PWC. But while the price might be right, a lack of performance can be a turnoff for adrenaline-seekers. Yamaha is blowing up that deficiency with the introduction of its new EXR. How did its engineers do it? 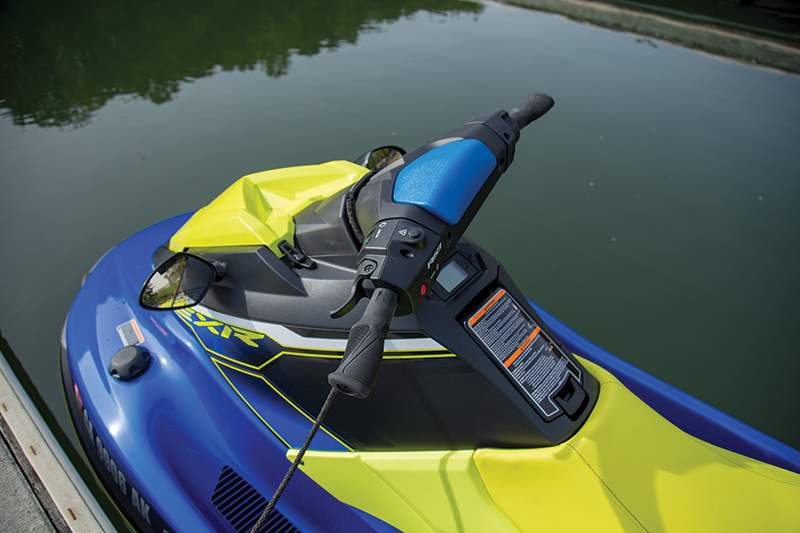 First, they used Yamaha’s NanoXcel 2 technology, which is stronger and lighter than fiberglass, for the deck and hull. Previously only used on higher-end models, NanoXcel 2 reduced the EXR’s weight to 540 pounds, which is 60 pounds less than the EX Deluxe. Then, they boosted the 1049 CC TR-1 engine by 10 percent and created the TR-1 High Output, which cranks out about 110 hp. 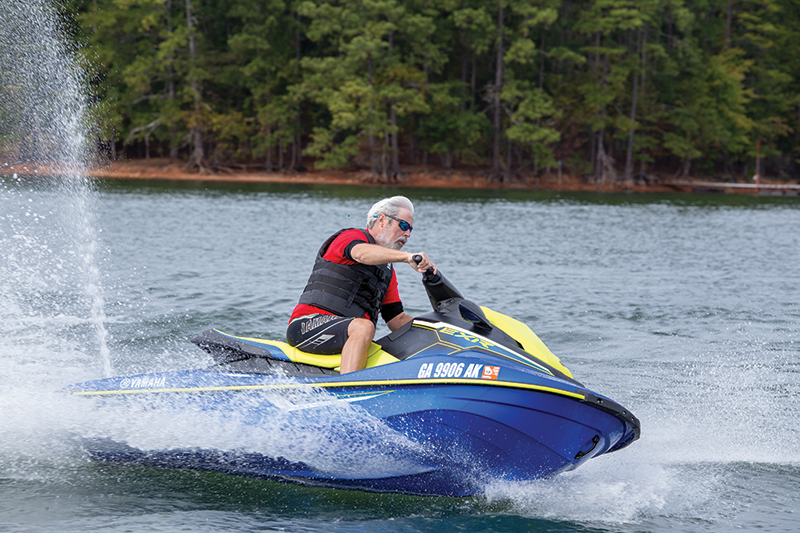 The result is a WaveRunner with some attitude: a 0-30 mph time of 2.4 seconds and a top speed of 54 mph. Rec-Lite is usually the code phrase for a lack of high-end features. And while the Yamaha EXR’s dash setup is pretty basic and it lacks Connext or electronic trim, it does have RiDE with Traction Control, which gives the operator the ability to shift into reverse by pulling the left-hand counterpart to the throttle. It can be used to brake in emergency situations and it delivers control dockside. The EXR always starts in neutral for safety. 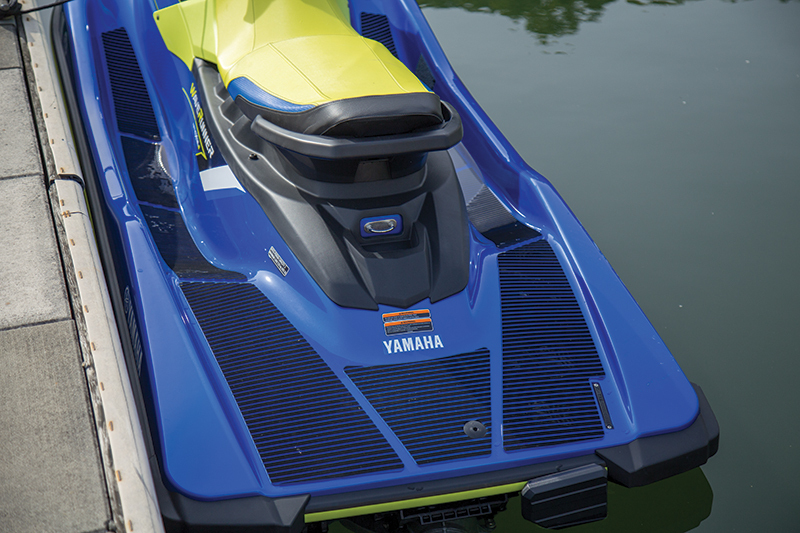 At 124 inches — 8 inches shorter than the VX hull — the Yamaha EXR is relatively short, but that helps it achieve nimble handling. And it’s remarkably stable. When we were shooting video, I did figure-8s in one spot for the camera, and it handled the resulting chopped up water in a very predictable manner. Its price is a budget-friendly $9,299, and buyers get plenty of extras, including a large two-tone padded rear deck and a reboarding ladder. NanoXcel 2 creates a dense surface that really shines — all the better to show off its bold Azure Blue and Lime Yellow finish. It has a 13.2-gallon fuel tank, which is large by Rec-Lite standards, for plenty of range. Storage capacity is 7.7 gallons, which is quite a bit less than the larger, similarly priced VX’s 24.6 gallons of storage. One of the few options is a pair of wireless Bluetooth speakers ($299), to add a soundtrack to the ride. LOA: 10 ft., 6 in. Beam: 3 ft., 9 in.